Finding an auxetic liquid crystal elastomer. Being completely honest, we did not intend to develop synthetic molecular auxetics – materials which have been a longstanding goal of the auxetics community. 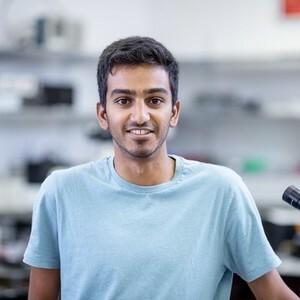 When I started my PhD I was a freshly graduated physicist in a group (led by Prof. Helen Gleeson) with decades of experience at the forefront of liquid crystals (LCs) but zero experience with liquid crystal elastomers (LCEs) – the materials key to my research. My first job was to find a LCE with a quick and facile synthesis route which could be performed with my skills set, using commercially available starting materials and equipment available to me. Finding such a LCE was a critical first goal and major challenge of my PhD! Over the years a plethora of LCE chemistries have been developed, from the pioneering polysiloxane and acrylate LCEs of the 1980s and 1990s to the acrylate-amines and thiol-acrylates of recent years. [1,2] Looking at these various options I decided that acrylates offered me the best chance of success as numerous monomers could be commercially bought and photopolymerisation sounded like the kind of chemistry that I could manage. There was however one major problem, acrylate LCEs – composed of commercially available monomers – had glass transition temperatures (Tgs) above room temperature. Such acrylate LCEs were therefore brittle and difficult to work with at ambient conditions. While my supervisor and group has long collaborated with chemists who may have been able to synthesise low Tg LC monomers, I needed grams worth of monomer for my research. I therefore turned to adapting the well-studied acrylate LCE developed by the Urayama group (made from commercially available monomers) in order to lower its Tg from 50°C to below room temperature. Ten months later I finally had a LCE with a Tg of 14°C that I could work with. 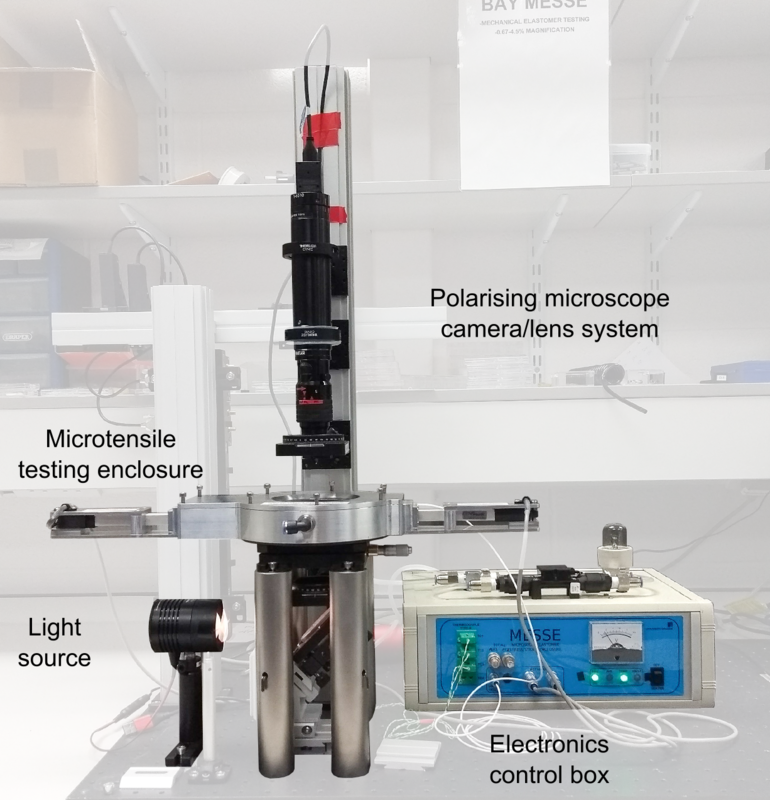 To truly understand the mechanical behaviour of our new LCE we decided to develop a bespoke miniature tensile rig which allowed us to simultaneously view our sample with a high powered lens via transmitted white light and with crossed polarisers. This equipment, dubbed the Microscope Elastomer Stress-Strain Enclosure (MESSE, see figure), was critical to our discovery of synthetic molecular auxeticity. There isn’t enough space here to detail the capabilities of MESSE so for more information please see Ref. 3, its supplementary information and our new paper “Coincident Molecular Auxeticity and Negative Order Parameter in a Liquid Crystal Elastomer” published in Nature Communications and which can be read here, https://www.nature.com/articles/s41467-018-07587-y. In short, MESSE revolutionised my PhD. It was central to all aspects of my research, was fun to build and will be a unique asset to my group for years to come! 1. Kularatne, R. S., Kim, H., Boothby, J. M. & Ware, T. H. Liquid crystal elastomer actuators: Synthesis, alignment, and applications. J. Polym. Sci. Part B Polym. Phys. 55, 395–411 (2017). 2. Ula, S. W. et al. Liquid crystal elastomers: an introduction and review of emerging technologies. Liq. Cryst. Rev. 6, 78–107 (2018). 3. Urayama, K., Arai, Y. O. & Takigawa, T. Volume Phase Transition of Monodomain Nematic Polymer Networks in Isotropic Solvents Accompanied by Anisotropic Shape Variation. Macromolecules 38, 3469–3474 (2005). 4. Mistry, D., Morgan, P. B., Clamp, J. H. & Gleeson, H. F. New insights into the nature of semi-soft elasticity and ‘mechanical-Fréedericksz transitions’ in liquid crystal elastomers. Soft Matter 14, 1301–1310 (2018). 5. Küpfer, J. & Finkelmann, H. Nematic liquid single crystal elastomers. Die Makromol. Chemie, Rapid Commun. 12, 717–726 (1991). 6. Küpfer, J. & Finkelmann, H. Liquid crystal elastomers: Influence of the orientational distribution of the crosslinks on the phase behaviour and reorientation processes. Macromol. Chem. Phys. 195, 1353–1367 (1994).